I have been looking forward to giving the Epson PowerLite Home Cinema 2000 a test run. I liked the idea of watching The Matrix on the wall of my media room. Therefore, I moved my furniture around to create an open wall, hoping that it would be well worth the effort. The Epson HC2000 was good to go right out of the box. It is light and compact which is a plus for portability. It comes with a remote control and a CD with the user instructions. The projector has two HDMI ports which offers flexibility in my complex media set-up. The picture quality was top notch with minimal adjustment. The projector delivers full HD 1080p and can project up to 300” on your wall or screen. The HC2000 has adjustable legs in order to help you get the best viewing angle for your needs. 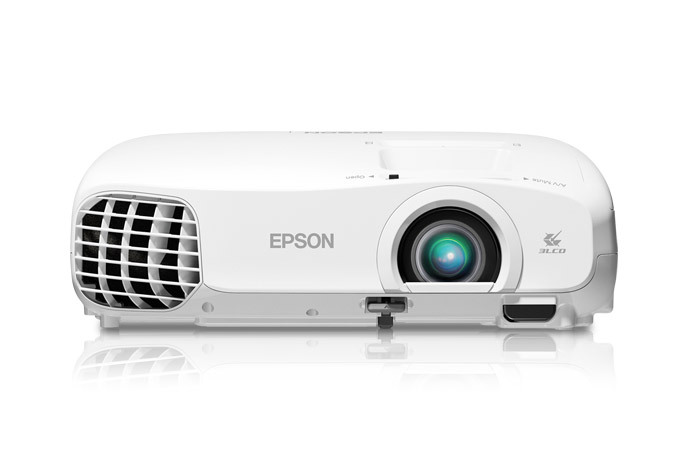 The HC2000 uses the proprietary 3LCD technology found in all Epson projectors. Epson claims up to three times brighter colors with the 3LCD technology. This technology offers a better picture in normal lighting conditions. The HC2000 features both color and white brightness at a better than average 1800 lumens. This means I was able to get the same bright, vivid colors that I have experienced with the PowerLite Home Cinema 2030, a slightly upgraded version of the HC2000. One of the nice features on the HC2000 is the built-in speaker on the projector. If you wanted to have a movie night in the backyard, you wouldn’t necessarily have to set up an audio system. The built-in speaker can also be used in conjunction with your home theater system or sound bar to enhance the audio experience. Another fun feature of the projector is the ability to show 3D images. Epson’s rechargeable 3D glasses are required (sold separately) or comparable glasses, but it is good to know that my viewing experience is not limited by dimensions. By far, my favorite feature on the HC2000 is the MHL (Mobile High-Definition Link). MHL allows you to use the projector as an extension of what displayed on any MHL capable tablet or smartphone. Your device can be charging while you’re watching YouTube on the projector. The MHL feature takes the viewing experience to another level of portability and convenience. The Epson PowerLite Home Cinema 2000 is a projector that certainly gives you a lot of bang for your buck. Priced at USD $799.99, this is a high-quality projector at an exceptional value.